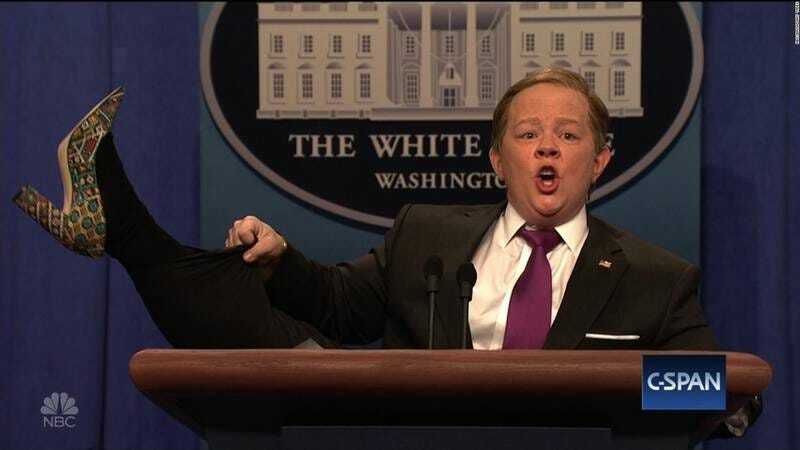 Melissa McCarthy’s no stranger to Saturday Night Live; not only is the Ghostbusters star about to earn her entrance papers to the Five-Timers hosting club, but she’s also been a regular presence this season thanks to her impression of White House hedge-hider Sean “Spicey” Spicer. That familiarity doesn’t seem to have dampened McCarthy’s enthusiasm for the NBC sketch show, though, at least not according to the latest promo for this Saturday night’s broadcast. The teaser shows McCarthy dancing around Studio 8H, lip-syncing to “I Feel Pretty” from West Side Story, before descending into the makeup chair for her transformation into the ever-beleaguered White House press secretary. McCarthy’s pulled out all the stops in the past in her portrayal of Spicer—dressing up in a bunny costume, rampaging around the set in a mobile podium—so she’ll have to go all-out this week, lest the real Spicer have nothing to tepidly joke about when he tries to “play along” with McCarthy’s jabs the following Monday.